Live Like A Hero Of An Action Movie! 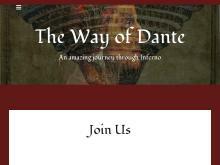 You Can Experience A 9 Days Journey Through Dante`s Inferno. Tags: , alighieri, dante, divine comedy, inferno, movie, personal development.